In 2001 Patricia Zuk discovered that there are stem cells in fat from liposuction, calling them ADSC ( adipose derived stem cells ). Further research revealed that these stem cells can play an important role in autologous fat transfer: they release growth factors that promote the growth of blood vessels and can also change into fat cells. This ability makes them essential to improve the healing of the transferred fat cells in autologous fat transfer. Stem cell enrichment only useful by excess fat! It has been shown that the healing rate of transplanted fat can be increased through stem cell enrichment by about 20 – 25%, if one doubles the number of stem cells. When operation is thus twice removed as much fat as the planned expansion is necessary. Half of the recovered fat is processed and the stem cells from it are isolated. The leftover fat from this portion is discarded. 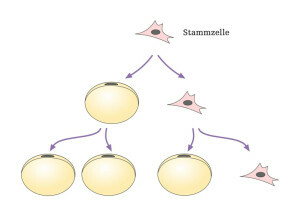 After the procurement of stem cells they are added to the other fat portion, thereby doubling the number of stem cells. This means that stem cell enrichment is only useful only under certain conditions: as it takes double the amount of fat to perhaps achieve a 25 % increase in healing rate. Example: Autologous fat transfer with enrichment : two breasts will be enlarged with 250g = 500g autologous fat. For the enrichment twice as much fat is needed, for a total of 1000g autologous fat. Without stem cell enrichment, healing rate is about 70% , with the enrichment + 25 % = + 17.5 % , so at best 87.5 %. This leaves a per breast increase of 218g. If instead of the enrichment operation, after three months the operation is simply repeated, the calculation is quite different. 350g – 218g = 132g ! It is thus clear that a repeat of the operation brings much more than a stem cell enrichment. It thus appears that stem cell enrichment can only be recommended if the patient really has sufficient fat available to remove twice the amount of fat in one or two operations. A thin/ slender patient for breast augmentation should receive autologous fat in several operations, each with small amounts of fat. In a thin / slender patient, breast augmentation with stem cell enrichment is computationally disadvantageous and therefore counterproductive. Discuss these facts with your doctor before undergoing breast augmentation with autologous fat and stem cell enrichment.